An ACL sprain is a tear of the anterior cruciate ligament in the knee joint. If you suspect you have a torn ACL then seek professional medical attention. ACL tears usually occur as a result of a twisting movement when your foot is in contact with the ground. The main symptom on the field of a torn ACL is usually a sudden pain in the knee. In most cases you will be aware that something serious has happend. Some patients describe an audible pop or crack at the time of injury. Swelling in the knee usually develops rabidly, but not in all cases. Your knee may also feel very unstable. The rapid swelling is caused by bleeding within the joint. This is due to ruptured blood vessels around and within the ACL which causes bleeding into the joint cavity. The athlete will know this has happened because the knee will also become warm to touch. Most athletes will usually seek professional advice at an injury clinic over the next couple of days. By this time, the swelling will have increased which will make it very difficult to move the knee. A doctor or physiotherist may find it harder to make a diagosis because of the swelling and limited movement. If this is the case, you may need to rest a few days whilst the swelling subsides. Then return to have your knee re-assessed. In particular you will have difficulty straightening the leg fully. You feel pain and tenderness around the knee joint. The patient lies on their back and bends the injured knee to 90 degrees. The foot is flat on the treatment bed (the practitioner may stabilize the foot by sitting on it). The practitioner holds the upper tibia (shin bone) with both hands, just below the knee joint. Then they pull the tibia forwards to assess how much movement there is and if there is any pain. Every patient is different so it is important compare the injured knee with the healthy one. If you feel no pain then it could be because your ligament is ruptured completely. The patient lies on their back with the knee flexed between 15 and 30 degrees. The practitioner grasps the outside of the lower femur (thigh bone) with one hand, just above the knee joint. The other hand is on the inside of the upper tibia. The femur is kept still with the upper hand while the lower hand pulls the tibia forward. A positive result is seen if the tibia moves excessively forward compared to the other (healthy) knee. Also, if there is not a hard end point felt then this also indicates a torn ACL. If the ligament is completely torn then this test may be pain-free because there is no ligament to be stretched. In addition, the practitioner may also test the range of motion, and the strength of surrounding muscles. They will also do a number of other tests to assess for associated injuries, such as meniscus tears. An MRI scan can confirm the diagnosis of an ACL sprain. An X-ray is only useful to detect a bony injury such as an associated avulsion fracture. This is where the ligament tears, pulling a small piece of bone away with it. 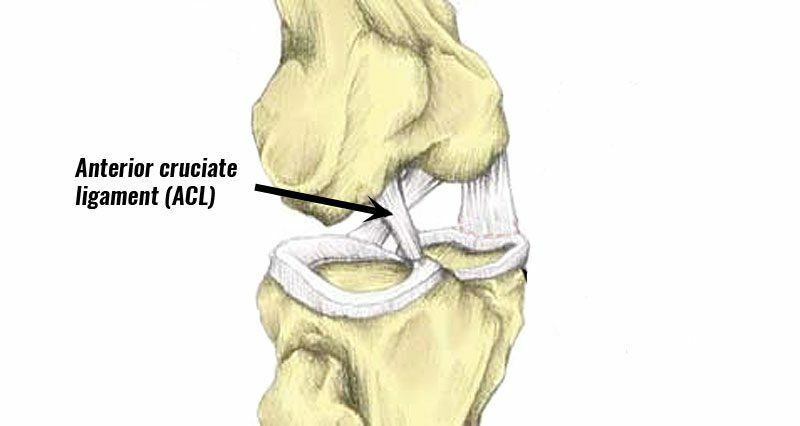 Causes & anatomy – what is an ACL sprain? An ACL sprain is damage to the anterior cruciate ligament in the knee. This can either be a partial tear or a full tear (rupture) depending on the force of the injury. The anterior cruciate ligament runs diagonally across the knee. It originates from the back of the femur (thigh bone) and attaches to the front of the tibia. Its function is to prevent the tibia (shin bone) from moving excessively forwards. Injuries to the ACL usually occur as a result of either a twisting force in the knee. This can happen when landing after a jump. The foot is planted on the ground, whilst the knee twists inwards. You may also sustain an ACL injury from contact with opponents, particularly in sports such as rugby or football. But this is far less common (Boden et al., 2010). A direct blow to the outside of the knee causes it to buckle inwards. This causes excessive movement of the tibia and the result is often a torn ACL. With this type of injury, there is usually associated damage to other structures within the knee. For example medial ligament sprains or cartilage meniscus tears. Skiing is also a common cause of acl sprains. The tips of the skis dig into the snow causing the knee to twist. If you believe that you have a suspected ACL injury or tear, you should seek a professional advice asap. It is important to get an accurate diagnosis as you may need to be referred for surgery. Surgery is not always required for ACL injuries. Depending on the level of competition that you perform at, you may be advised to follow a non-surgical (conservative) approach. The aim of this will be to build up the muscles to protect the torn ACL. Immediate first aid for ACL tears involves applying the P.R.I.C.E. therapy principles (protection, rest, ice, compression, and elevation). This will reduce the swelling and encourage healing. One method is to apply a cold compression wrap for 15 minutes intervals for at least the first 72 hours. Or until you have had the knee assessed by a specialist. A doctor or professional practitioner can make a full diagnosis which may not be possible until swelling has reduced. They are likely to send you for an MRI scan or X-ray to confirm the diagnosis and depending on the result, they may advise you to see an orthopedic surgeon. The aim of using a brace or acl taping is to support the knee following injury and to make the athlete feel more confident to move around. Taping is important if your knee is unatable as it will help protect other structures (ligaments and cartilage). Do not tape if you are unsure of the injury, or the purpose of taping the knee. This can sometimes give you a false sense of security and you may damage the knee even more. Knee braces may be used to help protect the knee joint, especially if it is unstable. It is not possible to brace, tape or support the knee to completely prevent injuries but knee taping can certainly help. 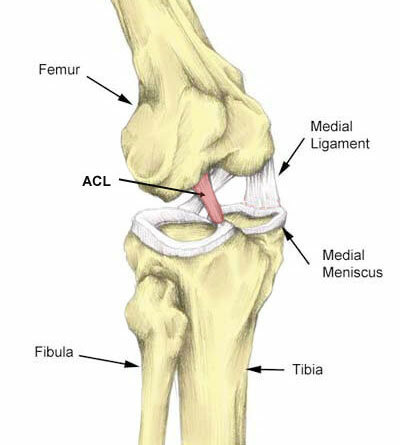 Once you have a diagnosis and the initial acute stage has passed, the first stage of ACL injury rehabilitation begins. Here the aim is to regain normal movement as soon as safely possible through mobility exercises. In cases where surgery is the treatment of choice, the surgeon will often delay the timing of your operation. This allows time for the swelling to go down and normal movement regained before reconstructing the ligament. You will be advised to do exercises prior to surgery for three reasons; to reduce swelling, to regain normal movement and to build up the strength in the muscles around the joint. If you opt for the conservative route (without surgery) then you will progress through a rehabiliation program of mobility and strengthening exercises. One of the most important aspects of ACL injury rehabilitation is to restore proprioception in the knee. Proprioception is your body’s ability to detect unwanted movements in the joints. After an ACL injury, your proprioceptive ability is diminished and needs retraining. Proprioception exercises teach the brain to know ‘where the knee is in space’. This enables the surrounding muscles to react quickly and so prevent further injury. Leading orthopaedic surgeon Mr. Richard Villar explains the surgery that is used for a torn ACL. The decision on whether to operate on the knee or not for an ACL sprain is a controversial one. It often depends on a number of factors such as the athlete’s age, their occupation, their lifestyle and the degree of instability within the knee. An orthopedic surgeon will be able to advise on which treatment approach is preferable. If you opt for reconstructive surgery, then the operation usually takes place as soon as possible after the injury has occurred. If your knee is very swollen you may be advised to wait a few weeks to let your knee settle down. Surgery is more successful if swelling is significantly reduced. A study indicated that cartilage loss from the back of the patella (kneecap) is greater in young patients who have early reconstructive surgery. Recovery rates after an ACL injury, either following reconstructive surgery or not vary greatly. Most patients may take 9 months or more to recover fully. However, within 4-5 months the knee should be starting to function normally. At this point you may be able to introduce change of direction drills into rehabilitation. It is not unusual that even 1-year post surgery, you may still lack confidence in your knee. Unfortunately for some this can continue for several years. Expert interview: Sports Physiotherapist Neal Reynolds gives tips on preventing torn anterior cruciate ligament injuries. Culvenor AG, Eckstein F, Wirth W, et al. Loss of patellofemoral cartilage thickness over 5 years following ACL injury depends on the initial treatment strategy: results from the KANON trial Br J Sports Med Published Online First: 08 February 2019.